Deputy Minister of Industry and Trade Do Thang Hai said recently the ministry would consider increasing the price of electricity this year. By taking various measures, Ho Chi Minh City aims to save 1.5 – 2 percent of commercial electricity output each year as from 2019. A campaign to respond to the Earth Hour was launched in Hanoi on March 10, sending the message “saving energy, protecting earth”. 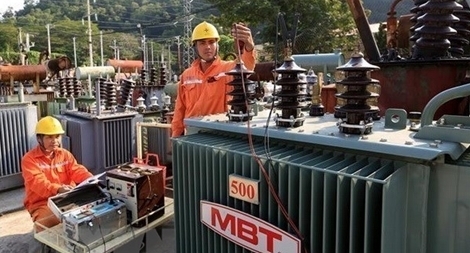 The Tay Ninh Power Company has splashed out 175 billion VND (7.7 million USD) on the upgrade and repair of 45 electricity grid works in key economic zones, as well as rural and border areas. The Southern Power Corporation of the Electricity of Vietnam (EVN SPC) is investing in building six new power works in Phu Quoc island district of the Mekong Delta province of Kien Giang. Power on Co To island district was restored at 4:00 am on June 29, according to Chairman of the district People’s Committee Tran Nhu Long. Investors are keeping their faith in Vietnam’s wind power sector, even though it is not taking off due to an unbankable purchase power agreement, seven years after the government released the incentives for wind power projects. The State-run Electricity of Vietnam (EVN) Group produced 74.42 billion kWh of electricity in the first five months of 2018, an increase of 10.5% from a year earlier. Almost 95 percent from Thuan Ha and Thuan Hanh border communes in Dak Song district, the Central Highland province of Dak Nong, have accessed electricity thanks to a local power project in 2014-2020 period. The implementation of synchronous measures to improve the power supply system has brought a facelift to Vietnamese rural areas, with 99.98 percent of communes nationwide and 98.83 percent of households accessing electricity as of 2017. Vietnam saved 485,000 kWh of electricity, equivalent to 834 million VND (36,612 USD), during the Earth Hour from 8:30pm-9:30pm of March 24, according to the National Load Dispatch Centre. The Northern Power Corporation (EVNEPC) has reported that in the first five months of this year, the firm supplied 21.4 billion kWh of commercial electricity, a rise of 12.47%year on year and reaching 37.14% of its yearly target. To deal with possible electrical shortages during the dry season, the Electricity of Viet Nam (EVN) will make the most of all power sources, including coal, gas, diesel-fueled and hydropower stations, a representative of the corporation has said. The country plans to have 800 megawatts of wind power by 2020, but pricing remains an issue. Imports in the first eight months alone far exceeded the official projection for the whole year, which comes as a surprise. PSNews-A ceremony to officially inaugurate the Lai Chau Hydropower Station was organized by the Electricity of Vietnam on December 20 in Nam Nhun district, Lai Chau province.